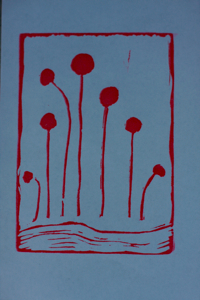 When I met local printmaker, Alynn Guerra last summer, I got inspired to try my hand at the art form. I bought supplies right after I interviewed Alynn for CraftSanity episode 65, but kept the inks, blocks and blades packed neatly away for about year. I can’t really explain why I didn’t dive into this like everything else. 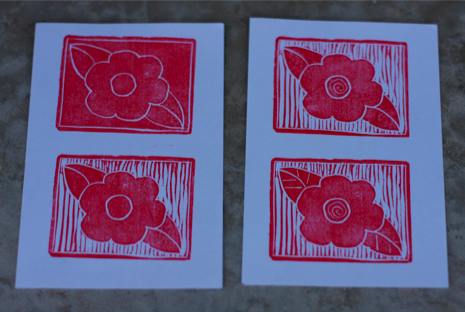 The good news is I finally took the plunge into printmaking yesterday when Alynn and I met at her studio. I showed her own to do some paper piecing applique quilting techniques and she walked me through my first print. (Shown above.) Wow. What fun! I can feel that this is the beginning of a brand new art addiction. Now part of me regrets that I took the background lines out. That’s the challenge, you have to figure out when to stop carving. Anyway, I had a great time carving this and plan to make some prints using more than one color at a time. And I have big plans to carve some blocks to print my own fabric soon, too. I did print my first print on a piece of fabric and that was a real kick. Sometime in the future I plan to print up some limited edition CraftSanity T-shirts. I think that would be fun. In the meantime, I’m gong to practice up so, I can get my skill level up to where it needs to be for a job like that. After meeting with Alynn, I went home and carved another block. Here is the progression of that design. This was super fun. And I think I might be getting a little better at this. 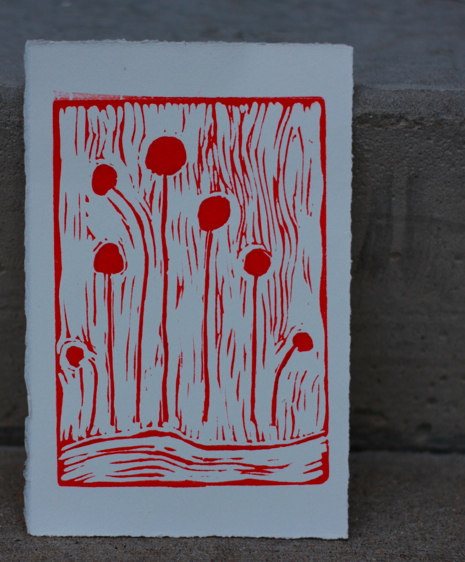 I used a regular stamp pad to print these test prints, because I wanted to work quickly. This design might have a future as a note card, perhaps. We’ll see. Okay, now that you’ve checked out my rookie prints, go check out Alynn’s art and get seriously inspired to try printmaking, too. You can read the column I wrote for about Alynn here. I’m a big fan of Alynn’s work and feel pretty lucky to get the opportunity to learn from such a talented artist. Thanks Alynn! Get Your Scrap Fix This Weekend in Grand Rapids, Mich.